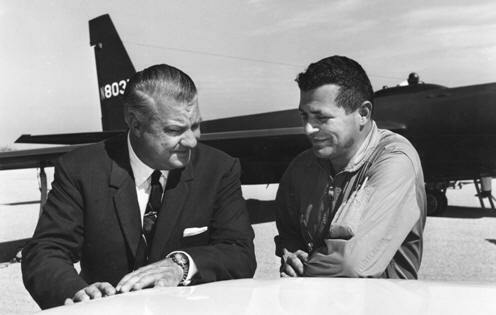 June 11, 2012 - Over 50 years ago, Francis Gary Powers was shot down over the Soviet Union (USSR ) in a U-2 spy plane. In Honor of his "exceptional loyalty" to the United States during his harsh interrogation while in captivity by the Soviet Union his family will be presented with the Silver Star in honor of Powers Friday during a ceremony at the Pentagon. The Silver Star is the third-highest combat military decoration that can be awarded to a member of any branch of the United States armed forces for valor in the face of the enemy. The Silver Star is awarded for gallantry in action against an enemy of the United States. The Silver Star may be awarded to any person who, while serving in any capacity with the armed forces, distinguishes himself or herself by extraordinary heroism. Powers has served in the Air Force until 1956 when he then joined the CIA's U-2 program at the civilian grade of GS-12. U-2 pilots flew espionage missions using an aircraft that could reach altitudes above 70,000 feet, making it invulnerable to Soviet anti-aircraft weapons of the time. The U-2 was equipped with a state of the art camera designed to take high-resolution photos from the edge of the stratosphere over hostile countries, including the Soviet Union. U-2 missions systematically photographed military installations and other important sites. In 1960 the U-2 was at the center of international politics. CIA civilian pilot Francis Gary Powers was shot down over the USSR while photographing missile sites at Sverdlovsk and Plesetsk. The Soviets reportedly fired fourteen newly developed SA-2 surface-to-air missiles at his U-2. Though none hit Powers' aircraft, one of the missiles at the extreme limit of its range and radar tracking ability exploded behind the U-2, and the shock damaged the fragile aircraft. In the engagement, the Soviets also accidentally shot down one of their own MiG-19 fighters, killing its pilot. Powers bailed out of his stricken U-2 and was captured. The Soviets conducted a show trial and sentenced Powers to 10 years in prison for espionage, but the United States and the Soviets exchanged him for a Soviet intelligence agent in 1962. After the Powers incident, the U.S. suspended U-2 flights over the USSR. On the world political stage, a U.S.-Soviet arms control summit planned for 1960 collapsed due to the Powers incident. The event contributed to growing mistrust between East and West, and this wariness nearly resulted in war during the Cuban Missile Crisis two years later. For more than 50 years, Lockheed Martin's U-2 has played a vital role in American strategic intelligence. The unique high-flying reconnaissance jet was designed early in the Cold War to overfly and photograph military activities in the Soviet Union and other communist nations. The U-2, nicknamed "Dragon Lady" after a comic strip character of the 1930s, has been used by the U.S. Air Force, the Central Intelligence Agency and the National Aeronautics and Space Administration.